Are you making the most of every single one? Sure, regular exercise can help you look and feel younger. Sometimes, even much younger. But this is ridiculous. Adidas' Reebok division expands its "Be More Human" platform today with a minute-long film called "25,915 Days." That title refers to the average number of days in a human life, and the spot, by Venables Bell & Partners, follows one woman's progress in reverse—from her participation in the Reebok-sponsored Spartan Race as a plucky senior to, well, the day she was born. In between, we see her at various stages of her life, jogging on a trail, running in various races and even streaking across a college campus. "We really liked the idea of telling this story through one person, in this case a heroine, because it clearly demonstrates how being more human isn't about a stage in life, one sporting event, or one moment. It's a lifelong commitment to bettering oneself," Yan Martin, Reebok's vp of global brand communications, tells Adweek. "Singling out and reflecting one person's lifelong passion and commitment really drives that message home." The film's opening sequences star 60-year-old Debbie Suzuki. The Manitoba native, a mother of five and grandmother of three, began running in high school and has more recently participated in a Grand Canadian Death Race and an Iron Man competition. "As a brand we always want to make sure we're being authentic with who we cast, featuring real athletes who are living our brand point of view," says VB&P creative director Tom Sharpf. "In this spot, we needed to not only find multiple runners throughout various life stages, but who could also believably be the same person. 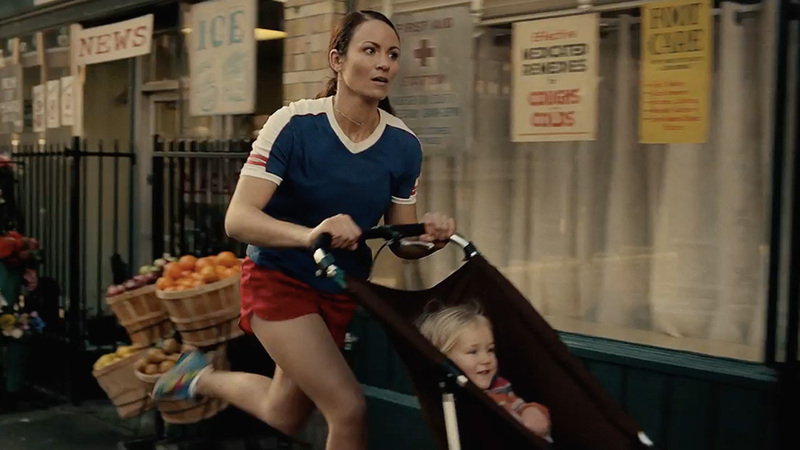 For the other life stages, we cast females that were believable younger versions of Debbie—sharing certain characteristics, like eye color, hair color and running style"
Of course, the reverse-time trick has graced plenty of ads, notably this Earth Hour spot from March. In "25,915 Days," the effect—well handled by Epoch Films director Michael Lawrence—feels novel yet familiar, adding a layer of appeal while subtly suggesting that Reebok will be there as your athletic footwear and gear partner for life (which, Yan says, was very much the point). As for the numbers that appear during the video—which actually count forward to "25,915," indicating how many days the heroine has left at each moment, instead of how many she's already lived—"by being precise with the average number of days, we've made the message more tangible and real for people," Yan says. "It immediately causes people to question, 'What day am I at? And am I making the most of what days I have left?' "
While this particular life-expectancy calculator is nowhere near as unnerving as, say, QuitBit, it does seem a bit much. Still, the approach is in keeping with the campaign's tough-fitness theme. And who knows, it might win out for Reebok in the long run. "Your time here is limited," Yan says. "So, time to get physical, get running, honor the body you've been given, and make the most of the days you do have left."